The Virginia Off Road Series, in collaboration with the Friends of Pocahontas State Park and the Virginia State Parks, is bringing PayDirt back for 2011! 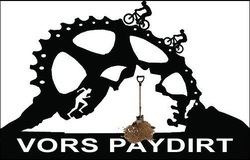 The VORS PayDirt program is an incentive to racers that awards Series points for trail work. These points will be counted with their final points total and count towards their final ranking at the end of the season. Trail riding is tough on the ground and the PayDirt program helps bring regeneration and rejuvenation to our trails in Pocahontas. All advovacy groups and trail users are also encouraged to get involved!